Anchor feet to decline device of choice (usually a decline bench). Slowly roll down to the starting position, the back should be slightly rolled (with the lower lumbars against the decline bench). Be sure to keep at least a slight bend at the knees. Cross arms over chest (left hand to right shoulder, right hand to left shoulder) or hands placed behind ears. Inhale, and in a smooth, controlled motion bring the torso up until the torso is at least perpendicular to the ground. Slowly lower the torso back down to the decline bench, exhaling throughout the movement. When bringing the torso to the up position, it is normal (and recommended) to have a slight bend to the spine. This is also know as rounding and is the chief method to alleviate stress placed on the lower spine. The arms crossed over the chest method is the easiest method. To increase the difficulty, place one's fingers behind one's ears. To understand why this makes it harder we simply look to physics. However, to avoid a lesson in physics we can summate the concept as follows. The further the weight gets from the pivot point, the more difficult the movement becomes. Placing one's elbows pointing outwards (opposed to inwards, towards the knees) increases the difficultly of this exercises slightly more yet. The decline bench allows for a unique opportunity to further increase the difficulty of this exercise by holding a weight plate across one's chest. As is evident, this is a more advanced exercise which requires caution, as well as relatively good abdominal strength before any attempts at it should be made. For a more intense workout, keep the spine from arching and focus on not touching the bench with your shoulder blade (scapula) when in the lowered position of the motion. Utilizing one's own body weight for exercises allows for greater repetitions. Depending on one's conditioning, repetition amounts should typically range from 25-100 per set. The easiest of methods for exiting the equipment is to do one final sit up then hold the top of the decline device. This will allow stability when exiting the desired position. Remove one leg at a time from the device. 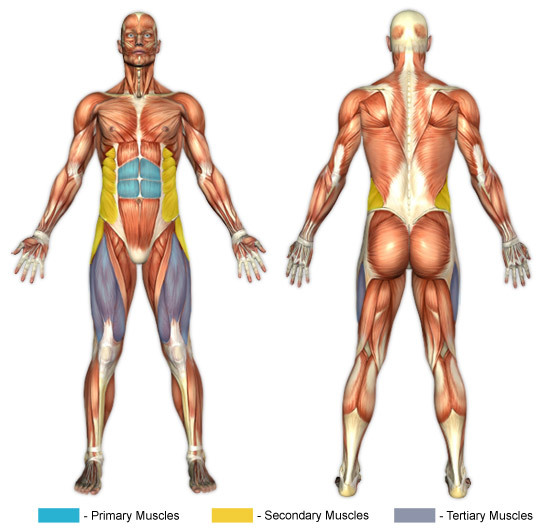 One must be cautious because over bending will nullify the results due to stress being removed from the abdominals. It is much easier to lose focus on the decline sit up motion because of the overall exercise positioning. Do not get into a "rocking" motion with this exercise. The curvature of the spine allow for this happen very easily and sometimes without even thinking about it. Slow and controlled movements are required to target the abdominal muscles. While you may be able to do more repetitions faster with rocking, it defeats the purpose of truly blasting one's abdominals. Further, exercises involving the abdominal core (particularly the rectus abdominis) call for rounding the back. Indeed, this is likely contrary to advice that you have heard for weight lifting in general, but in the case of exercises that focus on the aforementioned muscle group, rounding the back is recommended to prevent injury. Often, people will put themselves on insane abdominal programs to achieve the "6-pack" look. What many fail to realize is that while focusing on increasing abdominal stretch helps the muscles grow larger, the outer lay of fat between the abdominal and skin is what often prevents the "6-pack" from showing. So in some cases these individuals may have a great set of ripped abdominals that are concealed by adipose tissue (fat). See the Cardio and Nutrition sections for more information.